The old blueyonder site is now unavailable, as Virgin Media have withdrawn the facility to have Personal Web Space. Thanks to Niki Odolphie of Somerset Online we have this new site. While we add to the new site, you can continue to find information archived on our old site. The main area for our Ancestors is covered by the counties of Devonshire, Dorsetshire, Somersetshire, Gloucestershire and Wiltshire, with some from Cornwall, hence Our West Country Family. However, there are branches in almost every County of England, several Counties of Wales and some Scottish and Irish links. Obviously numerous family members have also made their homes across the seas, Australia, New Zealand, Canada and USA being the principal areas. Our Site now commences with Gina’s and my direct forebears. Other family lines are being added in the main Counties, and in the Rest of UK and Overseas. Please bear with us as we continue to develop the site. 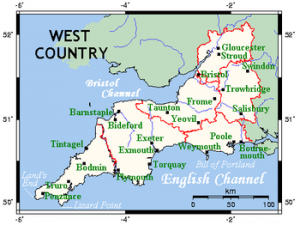 If you are interested in having research carried out, or wish to have an escorted visit to an area in the West Country, contact Jim on wessexresearcher @ yahoo.co.uk for details.